This post provides some information that may be useful for anyone wanting to go to the Wendenstöcke, Signal or Lehn. The main post on my trip there is here: Rock Climbing in Switzerland. 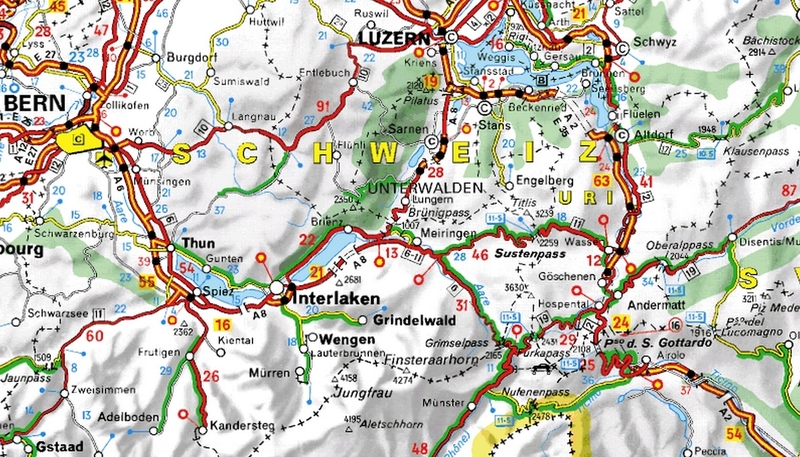 All these areas are close to Interlaken which is about 2 and a half hours by car from Geneva (via Bern) and just under 2 hours from Zurich (via Luzern). The Wendenstöcke is located on the west side of the Susten Pass. The nearest big town is Meiringen which is about half an hour’s drive away. There are campsites in Meiringen (we stayed in AlpenCamping), Innertkirchen (which is a smaller town about 10 minutes towards the Susten Pass from Meiringen) and Gadmen (a village on the main road just below the cliffs). There is a small road than leads from the main road above Gadmen to a parking area just before the hamlet of Wendenalp. (The cover image on this post is of the Wendenstöcke from this road). Signal is on the eastern side of the Engelhorn. The drive to the start of the walk-in takes about 20 minutes from Innertkirchen, first up the road Unterstock/Urbachtal then on a small, unmetalled road which ends in a parking area. The small road turns off just before the bridge over the river that runs out of the Urbachtal valley. There is a sign at the start small road saying ‘Verbot’ which we chose to ignore as it had been there since 1979! Lehn is close to Interlaken where there are a number of campsites. In 1997 we camped in Camping Hobby which is within walking distance of the crag. Schweiz Extrem West (published by Filidor in 2010) is a good guidebook to get as it has topos on all the above areas although it just covers the west of Switzerland. It also contains some great photos of the author of the older guide (Schweiz Extrem, published in 1994) decked out in full 1980’s climbing fashion; garish lycra tights combined with a special touch of his own. The older guide covers all of Switzerland. Strangely, as they are quite a good fall-back option if you can’t do the main climbs, the routes we did on the Glogghüser were not in the new guide (they are in the 1994 guide). Detailed information on the approach to the climbs is contained in the guidebooks. The walk to the base of the Wendenstöcke is up a very steep path and takes almost 2 hours. Even the approach to the Glogghüser, which a long way below the main faces, was over an hour. In other words, start early. As we found, many of the routes tend to be wet if there is melting snow on the mountains above although being south facing rain should dry off them quickly. On the approach to Signal, once you have reached Mad, follow the path to the walker’s left. Once in the meadows above the Urbachtal valley, head diagonally upwards. The traverse into the face starts below the highest band of cliffs that you can see. The path is not visible from below. The walk in took us just over 2 hours including some faffing trying to figure out where to go at this point. Also, the belays are generally two-bolt ones linked together with rope which may have degraded so it is worth taking some extra tape or cord to re-thread the belays if this is necessary. Finally, because there are no higher mountains above Signal, it is a good place to go when there is snow on the Wendenstöcke. Approaching Lehn, we ended up walking too far up the road. The first path to the crag leaves the road 100-200m after it starts going uphill, just by a sign-post that has Patagonia and other climbing related stickers on it.